These dogs love to explore the outdoors and is an enthusiastic trailer. Given sufficient exercise, it is a a calm house dog and makes an excellent children's dog – gentle, incredibly tolerant and always ready to join in a game. It is an independent breed and may run off if a trail beckons, it also barks and howls!! The Beagle is the smallest of the British scent hounds, whose ancestors may be traced to William the Conqueror's arrival in Britain. It was originally smaller and was carried around by hunters in their saddle bags. It was kept almost entirely as a working dog until the 1940's, but is now equally popular as a pet. The Beagle has soft brown eyes that betray his warm personality but do not reveal his admiral courage and stamina. A truly trustworthy friend can be found in him and he makes a great family pet, as he is always eager to romp and play. Left alone he may howl, but training can alleviate this problem, although he should not be left alone for long periods of time. 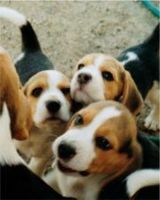 Our 4 Paw Rating - to the suitability of Beagles for your home and lifestyle. Discover How to make your Boxer dog happy healthy and obedient!